Dinosaurs evolved within a single lineage of archosaurs 232-234 Ma (million years ago) in the Ladinian age, the latter part of the middle Triassic. Dinosauria is a well-supported clade, present in 98% of bootstraps. It is diagnosed by many features including loss of the postfrontal on the skull and an elongate deltopectoral crest on the humerus. The process leading up to the Dinosauromorpha and the first true dinosaurs can be followed through fossils of the early Archosaurs such as the Proterosuchidae, Erythrosuchidae and Euparkeria which have fossils dating back to 250 Ma, through mid-Triassic archosaurs such as Ticinosuchus 232-236 Ma. Crocodiles are also descendants of mid-Triassic archosaurs. Dinosaurs can be defined as the last common ancestor of birds (Saurischia) and Triceratops (Ornithischia) and all the descendants of that ancestor. With that definition, the pterosaurs and several species of archosaurs narrowly miss out on being classified as dinosaurs. The pterosaurs are famous for flying through the Mesozoic skies on leathery wings and reaching the largest sizes of any flying animal that ever existed. Archosaur genera that also narrowly miss out on being classified as dinosaurs include Schleromochlus 220-225 Ma, Lagerpeton 230-232 Ma and Marasuchus 230-232 Ma. The first known dinosaurs were bipedal predators that were 1-2 metres (3.3-6.5 ft) long. Spondylosoma may or may not be a dinosaur; the fossils (all postcranial) are tentatively dated at 235-242 Ma. The earliest confirmed dinosaur fossils include saurischian ('lizard-hipped') dinosaurs Nyasasaurus 243 Ma , Saturnalia 225-232 Ma, Herrerasaurus 220-230 Ma, Staurikosaurus possibly 225-230 Ma, Eoraptor 220-230 Ma and Alwalkeria 220-230 Ma. Saturnalia may be a basal saurischian or a prosauropod. The others are basal saurischians. Among the earliest ornithischian ('bird-hipped') dinosaurs is Pisanosaurus 220-230 Ma. Although Lesothosaurus comes from 195-206 Ma, skeletal features suggest that it branched from the main Ornithischia line at least as early as Pisanosaurus. It is clear from this figure that early saurischians resembled early ornithischians, but not modern crocodiles. Saurischians are distinguished from the ornithischians by retaining the ancestral configuration of bones in the pelvis. Another difference is in the skull, the upper skull of the Ornithischia is more solid and the joint connecting the lower jaw is more flexible; both are adaptations to herbivory and both can already be seen in Lesothosaurus. Setting aside the basal Saurischia, the rest of the Saurischia are split into the Sauropodomorpha and Theropoda. The Sauropodomorpha is split into Prosauropoda and Sauropoda. The evolutionary paths taken by the Theropoda are very complicated. The Dinosauria (2004), a major reference work on dinosaurs, splits the Theropoda into groups Ceratosauria, Basal Tetanurae, Tyrannosauroidea, Ornithomimosauria, Therizinosauroidea, Oviraptorosauria, Troodontidae, Dromaeosauridae and Basal Avialae in turn. Each group branches off the main trunk at a later date. See Dinosaur classification for the detailed interrelationships between these. The first sauropodomorphs were prosauropods. Prosauropod fossils are known from the late Triassic to early Jurassic 227-180 Ma. They could be bipedal or quadrupedal and had developed long necks and tails and relatively small heads. They had lengths of 2.5 (8.2 ft) to 10 m (33 ft) and were primarily herbivorous. The earliest prosauropods, such as Thecodontosaurus from 205-220 Ma, still retained the ancestral bipedal stance and large head to body ratio. These evolved into the sauropods which became gigantic quadrupedal herbivores, some of which reached lengths of at least 26 m (85 ft). Features defining this clade include a ratio of forelimb length to hindlimb length greater than 0.6. Most sauropods still had hindlimbs larger than forelimbs; one notable exception is Brachiosaurus whose long forelimbs suggest that it had evolved to feed from tall trees like a modern-day giraffe. Sauropod fossils are found from the times of the earliest dinosaurs right up to the Cretaceous–Paleogene extinction event, from 227 to 66 Ma. Most sauropods are known from the Jurassic, to be more precise between 227 and 121 Ma. The Cretaceous sauropods form two groups. The Diplodocoidea lived from 121 to 66 Ma. The Titanosauriformes lived from 132 to 66 Ma. The latter clade consists of series of nested subgroups, the Titanosauria, the Titanosauridae and Saltasauridae. Both the Diplodocoidea and Titanosauriformes are descended from the Neosauropoda, the earliest of which lived in about 169 Ma. The sauropods are famous for being the largest land animals that ever lived, and for having relatively small skulls. The enlargement of prosauropod and sauropod dinosaurs into these giants and the change in skull length is illustrated in the following charts. 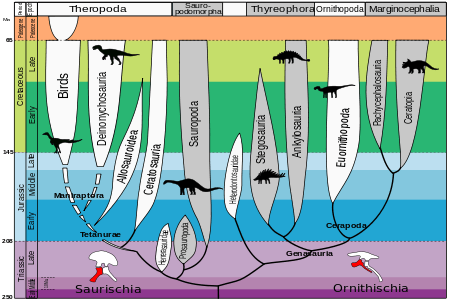 Dinosaurs used in creating these charts are (in date order): Eo Eoraptor; Prosauropods Ri Riojasaurus, Pl Plateosaurus, Yu Yunnanosaurus, Ms Massospondylus, Ji Jingshanosaurus, An Anchisaurus, Lu Lufengosaurus, Yi Yimenosaurus, ; and Sauropods Sh Shunosaurus, Om Omeisaurus, Mm Mamenchisaurus, Ce Cetiosaurus, Dc Dicraeosaurus, Br Brachiosaurus, Eu Euhelopus, Ap Apatosaurus, Ca Camarasaurus, Dp Diplodocus, Ha Haplocanthosaurus, Am Amargasaurus, Ar Argentinosaurus (approx), Bo Bonitasaura, Q Quaesitosaurus, Al Alamosaurus, Sa Saltasaurus, Ra Rapetosaurus, Op Opisthocoelicaudia, Ne Nemegtosaurus. With the exception of Argentinosaurus (included to fill a gap in time), these graphs show only the length of sauropods for whom near-complete fossil skeletons are known. It doesn't show other very large sauropods (see Dinosaur size#Sauropods) because these are only known from very incomplete skeletons. The ratio of skull length to body length is much higher in Eoraptor than in sauropods. The longest skull graphed is of Nemegtosaurus, which is not thought be a particularly large sauropod. The skull of Nemegtosaurus was found near the headless skeleton of 11 metre (36 ft) long Opisthocoelicaudia, and it has been suggested that they may be the same species, but see Nemegtosauridae. The relationship between the evolution of large herbivores and large plants remains uncertain. About 50% of the plants over the time of the dinosaurs were conifers, they increased in number in the Triassic until stabilising in about 190 Ma. Cycads formed the second largest group until about 120 Ma. Ferns were present in roughly constant numbers the whole time. Flowering plants began about 120 Ma and by the end of the period had taken over from the cycads. All dinosaur herbivores appear to have been adversely affected by the extinction event at the end of the Jurassic. By far the earliest fossils of Theropoda (not counting the basal saurischians) are of the Coelophysoidea, including Coelophysis and others, from late Triassic and early Jurassic 227-180 Ma. Cladistic analysis sometimes connects these to the group called Ceratosauria. Principal features of both include changes in the pelvic girdle and hind limb that differ between the sexes. Other ceratosauria first appear in the late Jurassic of western North America. These are followed by the basal Tetanurae, of whom fossils have been found from the mid Jurassic to past the end of the early Cretaceous 180 Ma to 94 Ma. They have a relatively short maxillary tooth row. They did not all branch off the evolutionary line leading to coelurosaurs at the same time. Basal tetanurans include Megalosauridae, spinosaurids, a diverse clade of allosaurs, and several genera of less certain affinities, including Compsognathus. With the exception of Compsognathus they are large-bodied. Allosaurs form a distinct long-lived clade that share some cranial characters. They include the well known Allosaurus and Sinraptor among others. The great radiation of Theropoda into many different clades of Coelurosauria must have happened in the mid to late Jurassic, because Archaeopteryx was around in about 152-154 Ma, and cladistic analysis has shown that many other groups of Coelurosauria branched off before that. Fossil evidence from China suggests that the earliest feathers were found on the primitive Coelurosauria. The most primitive of these, e.g. on the tyrannosauroid Dilong, were simply hollow-cored fibres that would have been useful for insulation but useless for flying. Occasional bones and cladistic analyses point to the Tyrannosauroidea branching off from the other Theropoda early, in the middle Jurassic, although nearly complete skeletons haven't yet appeared before Eotyrannus from 121-127 Ma, and the many close relatives of Tyrannosaurus itself don't appear before 84 Ma, near the end of the late Cretaceous. Ornithomimosauria fossils are known from 127 to 65 Ma. The earliest branch from the main line of Ornithomimosauria is believed to be Harpymimus. The Therizinosauroidea are unusual theropods in being almost all vegetarian. Fossil Therizinosauroidea are known from 127 to 65 Ma. Maniraptorans include Oviraptorosauria, Deinonychosaurs and birds. They are characterized by an ulna with a curved shaft. Oviraptorosaurian fossils are known from 127 to 65 Ma. They have a toothless skull that is extremely modified. The skeleton has an unusually short tail. Deinonychosaurs, named after the enlarged sickle-shaped second digit of the foot, are closely related to birds. They have two distinct families, Troodontidae and Dromaeosauridae. Troodontid fossils are known from 127 to 65 Ma. They have a more slender build and longer limbs. The earliest named troodontid fossil known is Sinornithoides. Dromaeosaurid fossils are known from about 127 to 65 Ma with the exception of Utahraptor. The skeletal remains of Utahraptor are about 127-144 Ma. This is interesting because according to a recent cladistic analysis, Utahraptor is about as far from the ancestral Theropoda as it is possible to get, further than Archaeopteryx. Dromaeosaurids have a larger second digit; this family includes the well known dinosaurs Dromaeosaurus, Deinonychus and Velociraptor. Ancient birds (Avialae) include both the Aves, which are defined as descendants of the common ancestor of modern birds and Archaeopteryx, and the more primitive Epidendrosaurus. Fossil birds stretch down from 154 Ma through the Cretaceous–Paleogene extinction event at 65 Ma to the present day. Scores of complete skeletons have now been found of the more recent Confuciusornis, which is an early representative of the Ornithurae. Ornithurans all have a bony pygostyle, to which tail feathers are anchored. For more details on the evolution of birds, see Evolution of birds. Ornithischia, as the name indicates, was coined for the birdlike pelvic girdle, although they are not the ancestors of birds. The ornithischian skull and dentition was modified very early by a herbivorous diet. Lesothosaurus separated early, but the skull of Lesothosaurus already shows such adaptations, with broad proportions, a less flexible upper jaw, and a more mobile connection for the lower jaw. Heterodontosauridae has been shown to be the basalmost group within Ornithischia. Heterodontosaurids are very small (body length < 1 m) and lived from the Late Triassic to Early Cretaceous. Apart from Abrictosaurus all have a short upper canine and longer lower canine. The forelimbs in known fossils are relatively long. The major clades were already established by the early Jurassic. The ornithischians divided into armoured thyreophorans and unarmoured ornithopods and marginocephalians. Surface body armour (scutes) is the most striking feature of the thyreophorans. Scutellosaurus has these but otherwise differs little from Lesothosaurus. It has a long tail and combined bipedal-quadrupedal posture that separates it from all later thyreophorans including Stegosauria and Ankylosauria. These two clades, although quite different in overall appearance, share many unusual features in the skull and skeleton. Stegosaurs are easily recognised by the prominent row of plates above the spine and long spines on the tail. Most stegosaurs, but not Stegosaurus, also have a spine over each shoulder. These spines and plates have evolved from the earlier surface scutes. Huayangosaurus is the oldest and most primitive known stegosaur. Ankylosaurs are easily recognised by their extensive body armour. The skull is heavily ossified. Early in their evolution, ankylosaurs split into the Nodosauridae and Ankylosauridae, distinguished by features of the skull. Ornithopods fall into distinct clades - Hypsilophodontidae, and Iguanodontia. Hypsilophodontids more closely resemble their ancestors than the heterodontosaurids do. The most distinctive features are short scapula and rod-shaped pre-pubic process. The earliest is Agilisaurus from the middle Jurassic of China. Iguanodontians are a diverse but morphologically tight knit array of genera known from fossils of the late Cretaceous. Significant modifications include the evolution of tooth batteries, a ligament-bound metacarpus and a digitigrade hand posture. Tenontosaurus is the most basal iguanodontian. Others include Iguanodon, Camptosaurus and Muttaburrasaurus. Marginocephalia are named for a shelf that projects over the back of the skull. They include the pachycephalosaurians and ceratopsians. Pachycephalosaurs are best known for their thick upper fronts to their skull. The oldest known is Stenopelix, from the early Cretaceous of Europe. Ceratopsians, famous for Protoceratops, Triceratops and Styracosaurus illustrate the evolution of frilled and horned skulls. The frills evolved from the shelf common to all Marginocephalia. Ceratopsians are separated into basal ceratopsians, including the parrot-beaked Psittacosaurus, and neoceratopsians. Diversity of ceratopsian skulls. A) Skeleton of Protoceratops. B) to I) Skulls. B) & C) Psittacosaurus side & top. D) & E) Protoceratops side & top. F) & G) Triceratops side & top. H) & I) Styracosaurus side (without lower jaw) & top. The evolution of ceratopsid dinosaurs shares characteristics with the evolution of some mammal groups, both were "geologically brief" events precipitating the simultaneous evolution of large body size, derived feeding structures, and "varied hornlike organs." The sequence of ceratopsian evolution in the Cretaceous is roughly from Psittacosaurus (121 -99 Ma) to Protoceratops (83 Ma) to (Triceratops 67 Ma and Styracosaurus 72 Ma). In side view the skull of Psittacosaurus bears very little resemblance to that of Styracosaurus but in top view a similar pentagonal arrangement can be seen. The first few lines of primitive dinosaurs diversified rapidly through the Triassic period; dinosaur species quickly evolved the specialised features and range of sizes needed to exploit nearly every terrestrial ecological niche. During the period of dinosaur predominance, which encompassed the ensuing Jurassic and Cretaceous periods, nearly every known land animal larger than 1 meter in length was a dinosaur. One measure of the quality of the fossil record is obtained by comparing the date of first appearance with the order of branching of a cladogram based on the shape of fossil elements. Close correspondence exists for ornithiscians, saurischians and subgroups. The cladogram link between coelophysids and ceratosaurs is an exception, it would place the origin of coelophysids much too late. The simplest explanation is convergent evolution - ceratosaur bones evolved independently into a shape that resembles that of the earlier coelophysids. The other possibility is that ceratosaurs evolved much earlier than the fossil record suggests. Most dinosaur fossils have been found in the Norian-Sinemurian, Kimmeridgian-Tithonian, and Campanian-Maastrichtian periods. Continuity of lineages across the intervening gaps shows that those gaps are artifacts of preservation rather than any reduction in diversity or abundance. In many instances, cladistic analysis shows that ancestral lineages of varying durations fall in those gaps. The length of missing ancestral lineages in 1997 range from 25 Ma (Lesothosaurus, Genasauria, Hadrosauroidea, Sauropoda, Neoceratopsia, Coelurosauria) to 85 Ma (Carcharodontosauridae). Because the dinosaurian radiation began at small body size, the unrecorded early history may be due to less reliable fossilization of smaller species. However, some missing lineages, notably of Carcharodontosauridae and Abelisauridae, require alternative explanations because the missing range extends across stages rich in fossil materials. Body size is important because of its correlation with metabolism, diet, life history, geographic range and extinction rate. The modal body mass of dinosaurs lies between 1 and 10 tons throughout the Mesozoic and across all major continental regions. There was a trend towards increasing body size within many dinosaur clades, including the Thyreophora, Ornithopoda, Pachycephalosauria, Ceratopsia, Sauropomorpha, and basal Theropoda. Marked decreases in body size have also occurred in some lineages, but are more sporadic. The best known example is the decrease in body size leading up to the first birds; Archaeopteryx was below 10 kg in weight, and later birds Confuciusornis and Sinornis are starling- to pigeon-sized. This occurred for easier flight. The ancestral dinosaur was a biped. The evolution of a quadrupedal posture occurred four times, among the ancestors of Euornithopoda, Thyreophora, Ceratopsia and Sauropodomorpha. In all four cases this was associated with an increase in body size, and in all four cases the trend is unidirectional without reversal. 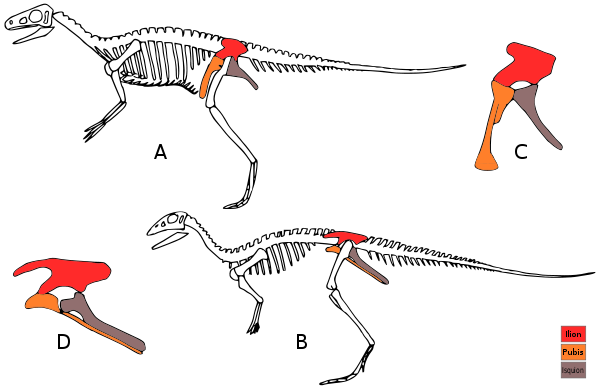 Dinosaurs exhibit a pattern of the reduction and loss of fingers on the lateral side of the hand (digits III, IV and V). The primitive function of the dinosaur hand is grasping with a partially opposable thumb, rather than weight-bearing. The reduction of digits is one of the defining features of tyrannosaurids, only having two functional digits on very short forelimbs. The ancestral dinosaur was a carnivore. Herbivory among dinosaurs arose three times, at the origin of the ornithischian, sauropodomorph, and therizinosaurid clades. Individual therizinosaurids are herbivorous or omnivorous. Herbivory among the ornithischians and sauropodomorphs was never reversed. The potential co-evolution of plants and herbivorous dinosaurs has been subject to extensive speculation. The appearance of prosauropods in the late Triassic has been tentatively linked either to the demise or diversification of types of flora at that time. The rise of ceratopsids and iguanodont and hadrosaurid ornithopods in the Cretaceous has been tentatively linked to the angiosperm radiation. Unfortunately, there are still no hard data on dietary preferences of herbivorous dinosaurs, apart from data on chewing technique and gastroliths. Dinosaurian faunas, which were relatively uniform in character when Pangaea began to break up, became markedly differentiated by the close of the Cretaceous. Biogeography is based on the splitting of an ancestral species by the emplacement of a geographic barrier. Interpretation is limited by a lack of fossil evidence for eastern North America, Madagascar, India, Antarctica and Australia. No unequivocal proof of the biogeographical action on dinosaur species has been obtained, but some authors have outlined centres of origin for many dinosaur groups, multiple dispersal routes, and intervals of geographic isolation. Dinosaurs that have been given as evidence of biogeography include abelisaurid theropods from South America and possibly elsewhere on Gondwana. Relationships between dinosaurs show abundant evidence of dispersal from one region of the globe to another. Tetanuran theropods travelled widely through western North America, Asia, South America, Africa and Antarctica. Pachycephalosaurs and ceratopsians show clear evidence of multiple bidirectional dispersion events across Beringa. The Cretaceous–Paleogene extinction event, which occurred 66 million years ago at the end of the Cretaceous period, caused the extinction of all dinosaurs except for the line that had already given rise to the first birds. ↑ Dave Smith. "The Saurischan Dinosaurs". UCMP. Retrieved 31 July 2011. ↑ "Introduction," Sampson (2001); page 264. ↑ Lewin, Sarah. "Did Dinosaurs Walk on Their Fingertips at One Point?". Retrieved 2015-06-01. Sampson, S. D., 2001, Speculations on the socioecology of Ceratopsid dinosaurs (Orinthischia: Neoceratopsia): In: Mesozoic Vertebrate Life, edited by Tanke, D. H., and Carpenter, K., Indiana University Press, pp. 263-276.